Fine-needle aspiration cytology (FNAC) of the breast is a rapid, cost-effective, and sensitive procedure to diagnose breast lesions, and was widely employed to diagnose breast lesions in the past. However, in recent times, core needle biopsy of the breast is gaining popularity and acceptability, although FNAC still looms large. There are some intrinsic disadvantages to FNAC, of which the most important is probably difficulty in classification of a significant percentage of breast lesions. Such lesions are usually denoted by the rubric "grey zone lesions of the breast." This article attempts to review these grey zone lesions and highlight the difficulties in diagnosing them. Background: Intraoperative diagnosis of central nervous system (CNS) lesions is of utmost importance for neurosurgeons to modify the approach at the time of surgery and to decide on further plan of management. The intraoperative diagnosis is challenging for neuropathologists. 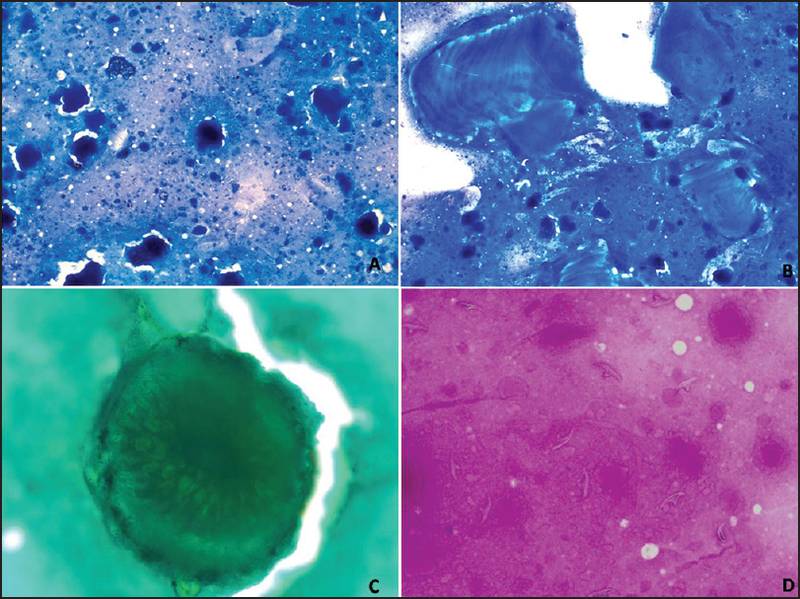 Aims: The study was undertaken to determine the accuracy of cytological techniques (crush smears and touch imprints), frozen sections of space occupying lesions of the CNS and compare it with histopathological diagnosis. Materials and Methods: A total of 75 specimens received intraoperatively were subjected to cytology and frozen section study. Results: Neoplastic lesions formed the major group with 62 (82.7%) cases while 13 (17.3%) were nonneoplastic. The diagnostic accuracy of "squash smears" was found to be 89.2%. "Touch imprints" showed diagnostic accuracy of 78.4%. The low accuracy of touch imprints was attributed to poor cellular yield. The diagnostic accuracy of "frozen section" was 75.7%. However, the overall diagnostic accuracy was 96%. Conclusion: We believe that the cytololgical methods and frozen sections are complimentary to each other and both should be used to improve the intraoperative diagnostic accuracy in the CNS lesion. Introduction: Pulmonary adenocarcinoma harbors various molecular abnormalities that include epidermal growth factor mutation, anaplastic lymphoma kinase gene re-arrangement, K-RAS mutations. The availability of targeted therapy against these molecular markers has revolutionized personalized medicine. 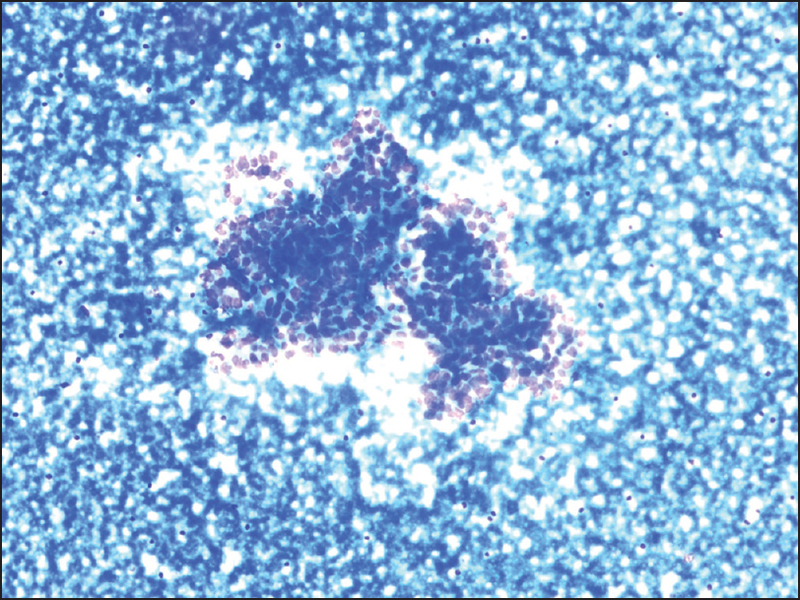 Accurate cytological diagnosis of pulmonary adenocarcinoma will aid in utilising the cytology smears for molecular testing. 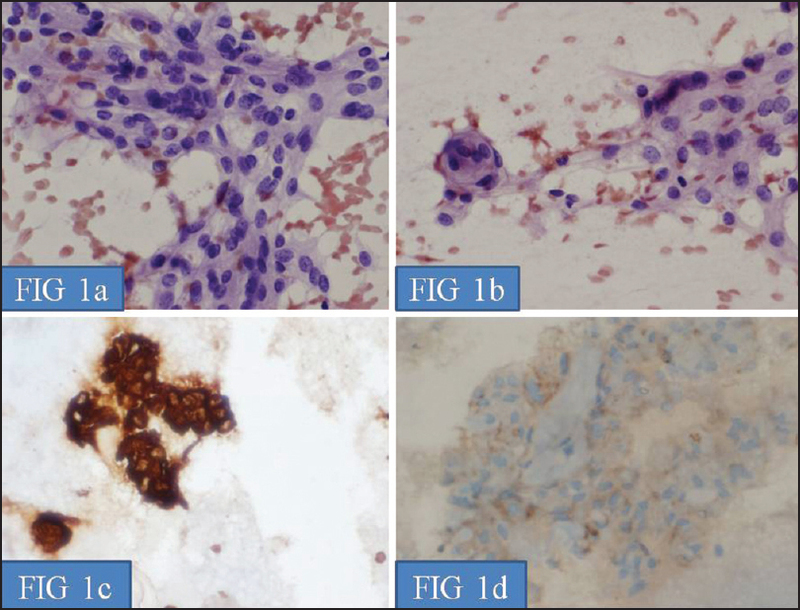 Objective: The objective of this retrospective study was to evaluate the diagnostic efficacy of various cytology samples in the diagnosis of pulmonary adenocarcinoma. Materials and Methods: The study included a retrospective case series of 50 patients with biopsy proven non small cell lung carcinoma of adenocarcinoma subtype. The corresponding cytology reports of all the 50 cases were analyzed for different samples including broncho-alveolar lavage (BAL), bronchial washings, bronchial brush smears, pleural fluid, sputum and guided fine needle aspiration cytology (FNAC) of lung and metastatic lymph nodes. The overall cyto-diagnosis efficacy as well that of various cytological samples were analyzed. Results: Multiple cytology samples were received in 14 of 50 cases. The overall diagnostic efficacy of the various cytology samples in the diagnosis of malignancy was 78% and 66.6% cases were accurately typed as non small cell lung carcinoma-adenocarcinoma. 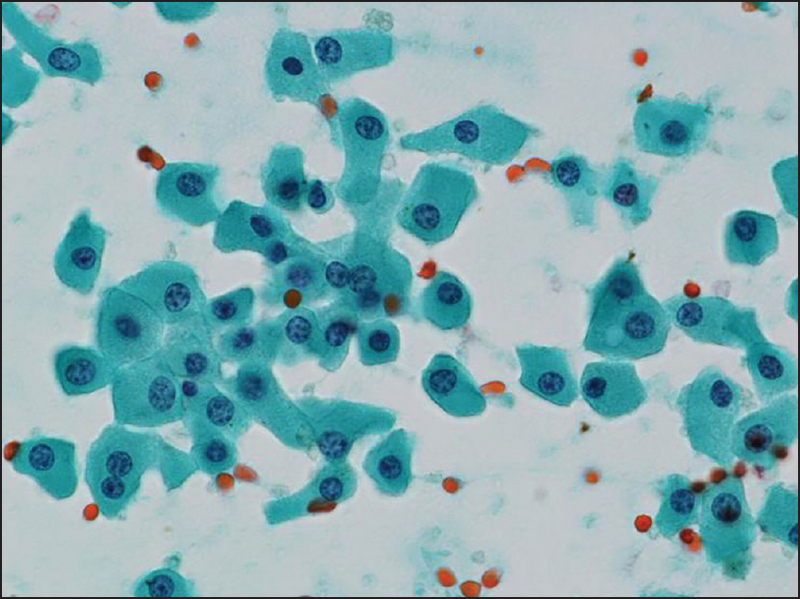 The best cytological sample for the detection of pulmonary adenocarcinoma was bronchial brush smears which had a detection rate of 70%. 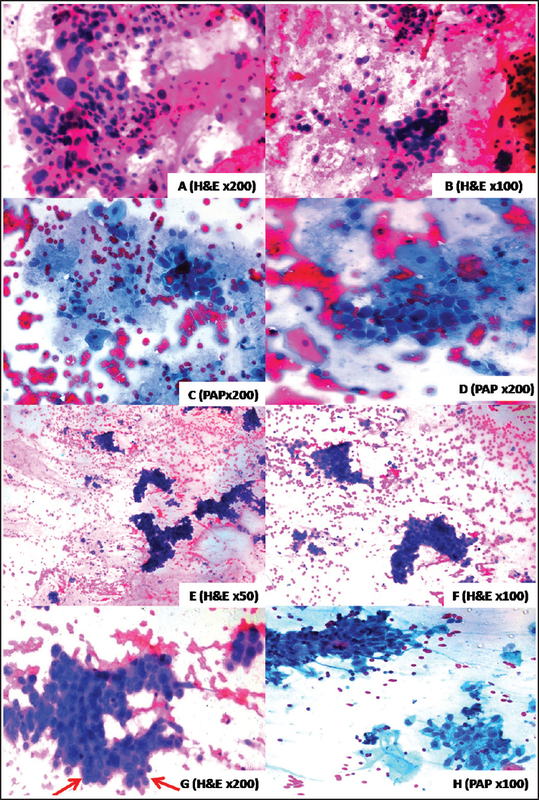 In fine needle aspiration cytology samples and bronchial washings the detection rate was 65.5% and 25% respectively. Discussion and Conclusion: In cases where the cytological diagnosis is certain the tissue biopsies can be simultaneously tested for EGRF and ALK gene mutations. Repeat biopsies are often required due to small amount of tumor tissue or necrotic biopsies. 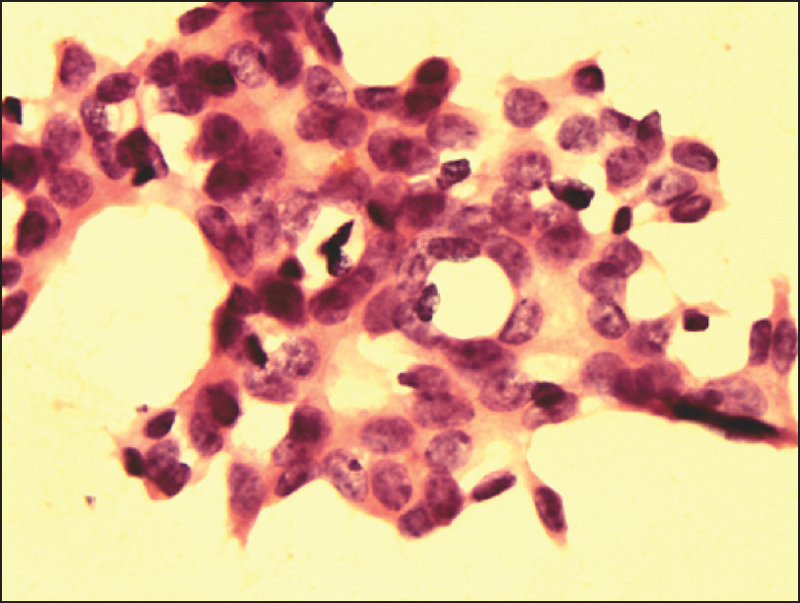 Alternate use of cytological specimen for molecular testing can be done when a diagnosis of pulmonary adenocarcinoma is established. 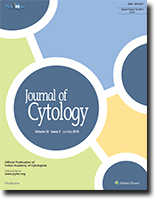 Background: The role of aspiration cytology has largely been ignored in pediatric population. The present study was undertaken to evaluate the role of fine needle aspiration cytology (FNAC) in non-hematological neoplasms in children in our institution, which is a rural tertiary care center. Materials and Methods: A total of 88 cases of non-hematological pediatric mass lesions were studied in which cytopathological diagnosis could be corroborated with histopathology. Results: Out of all the cases, 70 (80%) cases were benign tumors and 18 (20%) were malignant tumors. Fibroadenoma (37.9%) comprised the majority of cases in the benign category while small round cell tumors (SRCTs) (44.4%) comprised the majority of cases in the malignant category. Definite diagnosis could be offered based on the cytomorphology in 79.5% cases, while in 20.5% of cases only a broad cytological classification could be offered. Among the malignant lesions, FNAC showed 100% sensitivity while a specific diagnosis was made in 90% of cases. Conclusion: FNAC proved to be a rapid and fairly accurate tool in diagnosing non-hematological tumors in the pediatric age group. Background: Leprosy affects peripheral nerves. As Mycobacterium leprae has unique tropism for Schwann cells, thickened sensory cutaneous nerves provide an easy target for the detection of lepra bacilli and other changes associated with the disease. Materials and Methods: The data of patients with sensory cutaneous nerve involvement were retrieved from our record for the period January 2006 to December 2014. 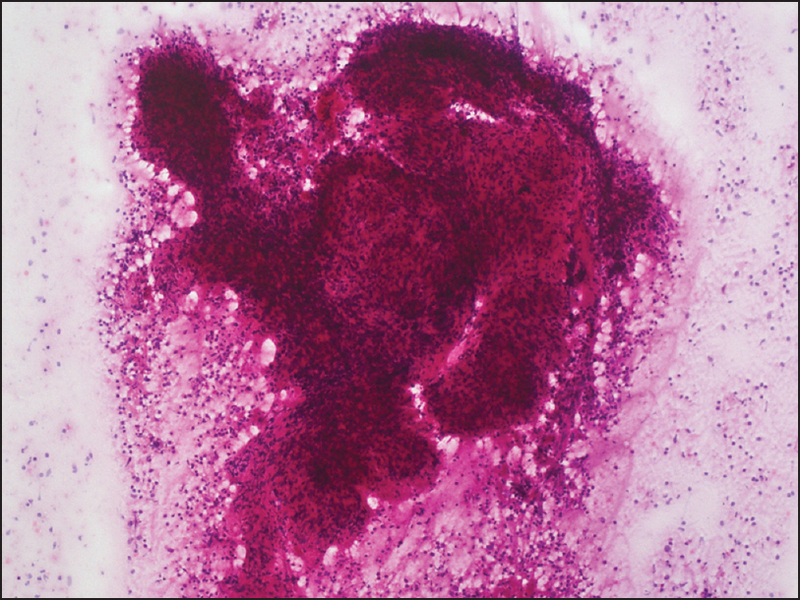 The hematoxylin and eosin (H and E)- and May-Grünwald-Giemsa (MGG)-stained slides were screened for Schwann cells, granuloma, and necrosis. Modified Ziehl-Neelsen (ZN)-stained smears were searched for lepra bacilli and globi. Morphological index was calculated in multibacillary lesions. Result: Twenty-nine sensory cutaneous nerves were aspirated in 23 patients. While 15 cases showed skin and nerve involvement, 8 cases showed only nerve involvement. Terminal cutaneous branch of the radial nerve was most often aspirated. No motor loss was observed after aspiration. Five cytologic pictures were seen - Epithelioid cell granuloma only in 6 cases, epithelioid cell granuloma with necrosis in 1 case, epithelioid cell granuloma with lepra bacilli in 3 cases, necrosis with lepra bacilli in 1 case, and only lepra bacilli in 12 cases. Morphological index ranged from 20% to 80%. Conclusion: Sensory cutaneous nerve fine-needle aspiration (FNA) is a feasible, viable, effective, and safe procedure. It adds to diagnostic FNA yield in patients with concomitant skin involvement and offers a way to evaluate patients with only nerve involvement. Calculation of morphological index allows prognostication and may have a role in assessing response to therapy and/or relapse. Tuberculosis is a common disease in developing countries such as India, posing a major public health problem. With human immunodeficiency virus (HIV) infection being a global endemic, there has been a resurgence of tuberculosis even in developed countries. Tuberculosis may affect almost any part of the body. However, tuberculosis of the calvarium is very rare. 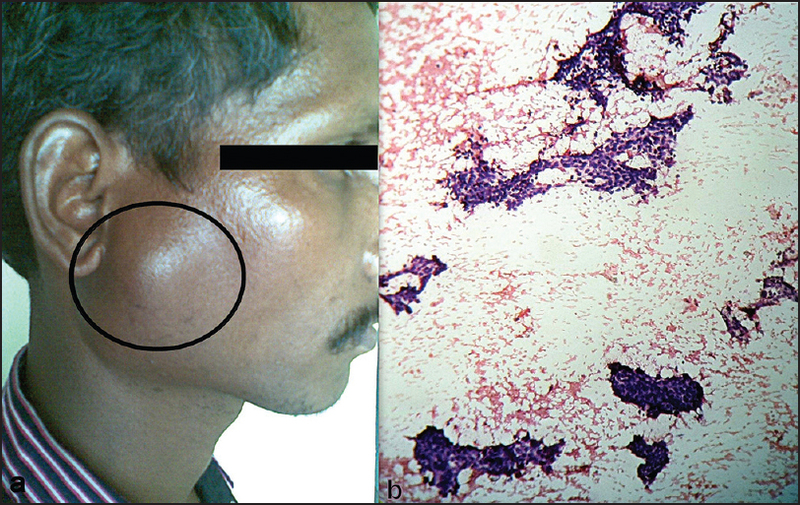 Presentation of tuberculosis as a soft tissue swelling on the scalp poses a diagnostic problem. 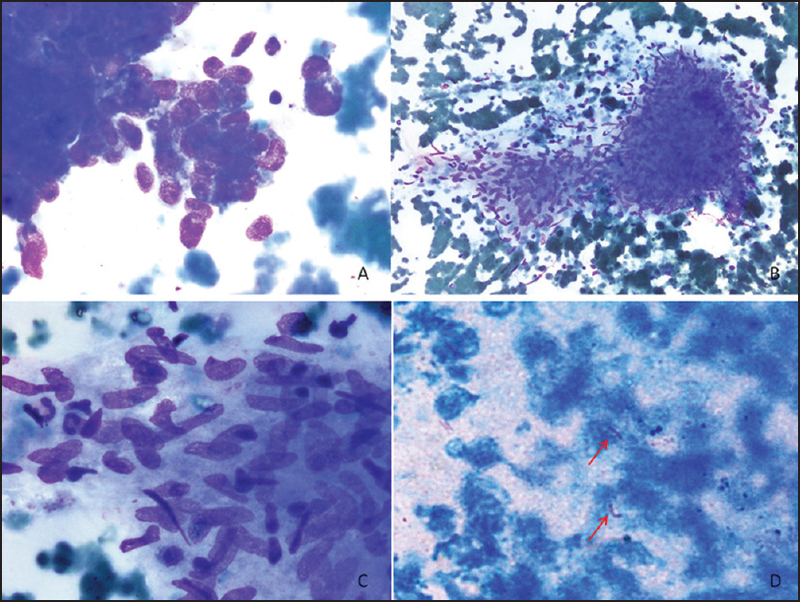 These two cases are being reported here to convey the utility of fine-needle aspiration cytology (FNAC) in providing the confirmatory diagnosis obviating the need for invasive surgical procedure. We report a rare case of a 69-year-old woman in whom diffuse large B-cell lymphoma (DLBCL) originated from the uterus and involved the urinary bladder. The cervical smears of the case mostly consisted of discohesive atypical round cells, which were highly suggestive of lymphoma; however, in voided urine smears, a majority of the cells formed large aggregates of degenerated cells, mimicking those of urothelial carcinoma (UC). The smears also represented some small loose clusters, in which tumor cells formed short chains with nuclear molding, mimicking those of small cell carcinoma. The cytodiagnosis got definitive when we identified the atypical cells that showed CD20+/CD3-/cytokeratin-/NSE- immunophenotype. These are of particular concern as they may have misleading similarities to other epithelial neoplasms when examining lymphoma involving the urinary bladder. Accordingly, this case highlights the importance of immunocytochemistry to rule out malignant lymphoma when encountering large and/or small loose clusters of atypical round cells on urinary cytology. 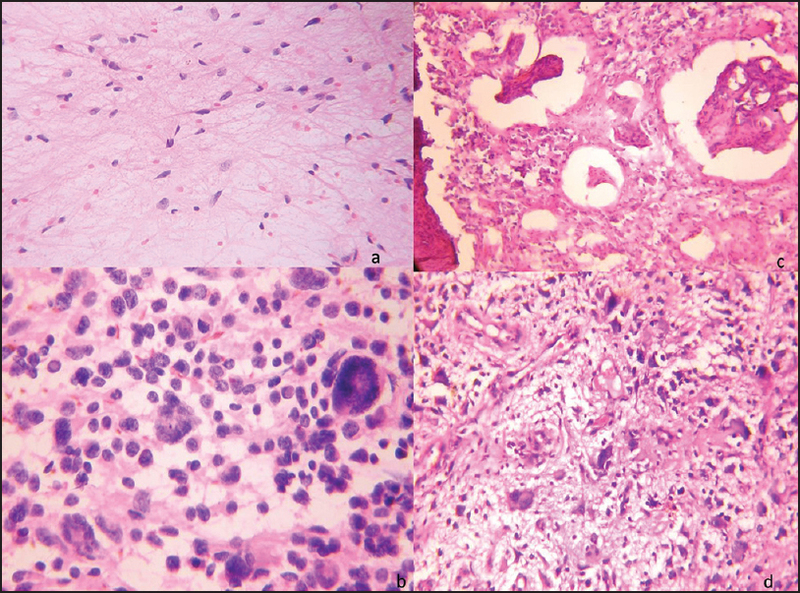 There is only one report on cytological findings of oncocytic variant of chromophobe renal cell carcinoma (RCC). 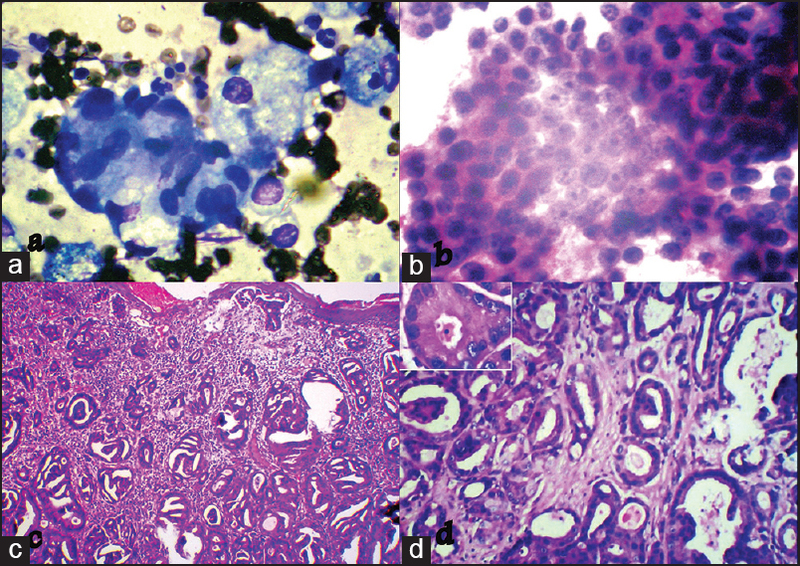 In this article, we report a new case with focus on cytological, and ultrastructural findings. A 60-year-old Japanese man was found to have a right renal tumor on medical checkup. In imprint cytological materials, the smears consisted of slightly discohesive clusters and isolated tumor cells with granular green colored cytoplasm on Papanicolaou staining. Nuclei were generally round and centrally located in the cytoplasm, but nuclear irregularity or perinuclear halo was absent. Ultrastructurally, the tumor was full of mitochondria with tubulovesicular cristae. Fluorescence in situ hybridization study using histological material showed multiple chromosomal losses including chromosomes 7, 10, 13, and 17. This finding supports the hypothesis that this variant may ultrastructurally show the nature of chromophobe RCC rather than renal oncocytoma. Histoplasmosis is an opportunistic fungal infection caused by inhaling the spores of a fungus called Histoplasma capsulatum. Disseminated histoplasmosis is the most common form associated with acquired immune deficiency syndrome (AIDS). 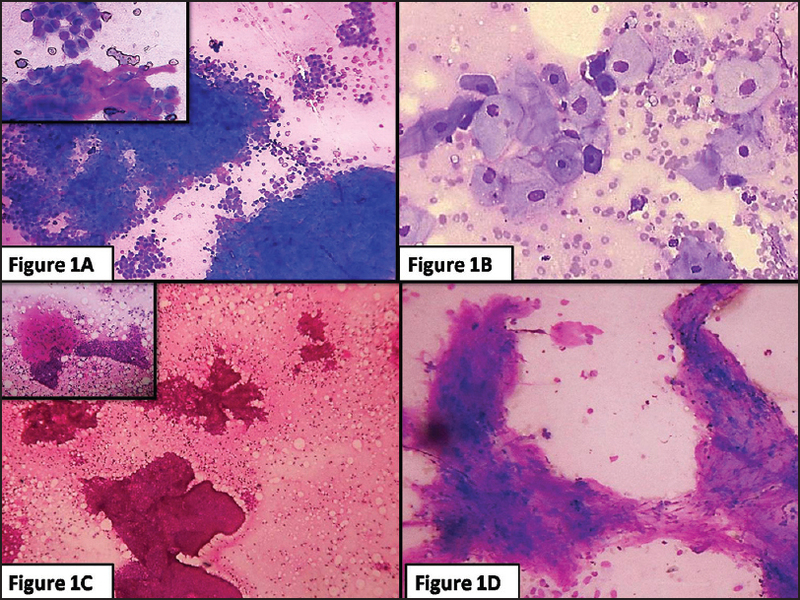 Here, we report a case of histoplasmosis presenting as isolated cervical lymphadenopathy in a human immunodeficiency virus (HIV)-infected patient diagnosed by a less invasive method (fine-needle aspiration cytology) and confirmed by fungal culture of fine-needle aspiration material. Due to varied and nonspecific clinical manifestations of histoplasmosis, most of the infections are misdiagnosed or underreported. It has to be considered in differential diagnosis of cervical lymphadenopathy, particularly in immunocompromised patients so that patients can be treated medically at an early stage before dissemination occurs and unnecessary surgery can be avoided. Here, we present this case because of its rare presentation as isolated cervical lymphadenopathy and classical cytological picture. Preoperative diagnosis of malignant salivary gland tumors is difficult as radiological imaging procedures have low sensitivity rate for detecting malignancy in parotid gland tumors. With careful and detailed analysis of cytological features, guided fine needle aspiration cytology can prove to be a reliable diagnostic modality that can help in differential diagnosis of cystic parotid malignancies from cystic benign tumors and non-neoplastic lesions. Papillary cystic variant of acinic cell carcinoma is a rare, cystic, primary neoplasm of salivary gland that occurs commonly in parotid .The tumor shows high local recurrence rate and has poorer prognosis compared to classic acinic cell carcinoma. Preoperative cytological diagnosis of papillary cystic variant of acinic cell carcinoma of parotid, in the case described here was the basis for adequate and timely surgical management with good results. Primary apocrine sweat gland adenocarcinomas are a rare entity, with only a few case reports so far. Many of these carcinomas are slow-growing with a high recurrence rate. A distinct cytological diagnosis can be made, and metastatic adenocarcinomas are always considered as a differential diagnosis on cytology. Our case was a 35-year-old male who presented with a discharging axillary sinus and swelling for the past 1 year. A clinical suspicion of tuberculous sinus was raised that however, remained unsupported by laboratory investigations. There was quite a high suspicion of apocrine adenocarcinoma on cytological examination that was confirmed by histopathology and immunohistochemistry. The patient was successfully treated with total excision and a wide margin. We report this case in view of its rarity and its occurrence in a 35-year-old young male, and emphasize that an initial cytological suspicion should be raised for primary apocrine adenocarcinoma in case of an axillary tumor, especially keeping in consideration the poor prognosis of the same and chances of early metastasis. The case of a 9-month-old infant who presented with an abdominal mass since birth is discussed here. 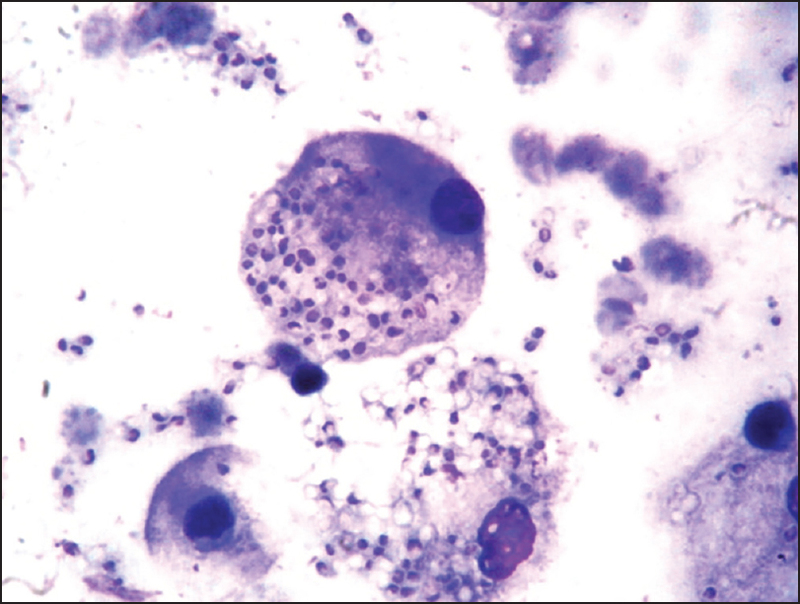 Fine-needle aspiration (FNA) cytology of this mass was performed, from which it was thought to be a small round tumor, possibly a hepatoblastoma (HB). Histopathologically, however, it was found to be a mesenchymal hamartoma (MH). This case report thus highlights this cytological limitation. Pleomorphic lipoma is a relatively rare adipocytic neoplasm, occurring predominantly in elderly males in the subcutaneous tissues of the neck or shoulder. To the best of our knowledge, only five cases have been reported in which the lesion was intramuscular. We hereby report a case of a 60-year-old female patient, presenting with an intramuscular, posterior shoulder mass. The aspirate showed a giant cell-rich lesion, admixed with short, plump-looking, spindly cells. There was no overt evidence of malignancy; however, the cell cytology was sufficiently atypical to warrant concern. Subsequent excision revealed a classical pleomorphic lipoma on histology with no evidence of malignancy. CD34 staining by immunohistochemistry further supported the diagnosis. Differential diagnosis and the cytological diagnostic pitfalls of pleomorphic lipomas have been discussed with a review of the literature. 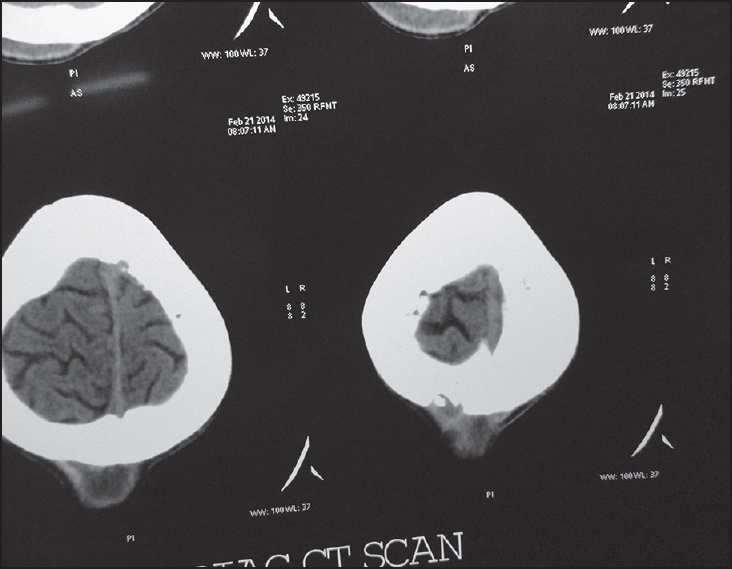 Meningiomas are common intracranial neoplasms. Meningomas are rarely subjected to fine-needle aspiration (FNA) studies. However, intraoperative squash preparations are commonly done. FNA of meningiomas are usually performed incidentally for cases with a clinical suspicion of some other disease such as metastatic carcinoma. 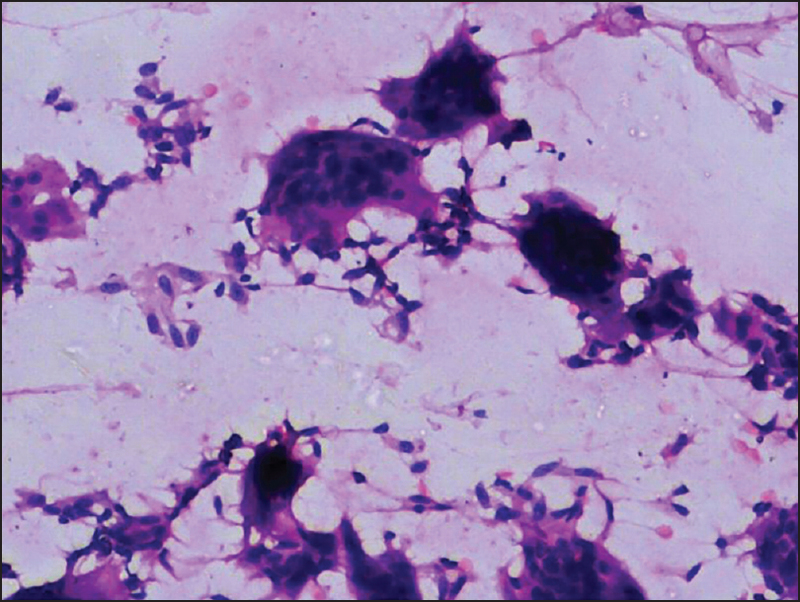 We are reporting two cases, which were referred to our center with a diagnosis of metastatic carcinoma on FNA from swelling of the temporal region. We are discussing the characteristic cytomorphological features, which help in diagnosing meningiomas, the common cytological differentials, and the utility of immunohistochemistry (IHC) on cell block preparations in confirming the diagnosis, especially when there is a clinical differential diagnosis.